During studio spring cleaning, I find all kinds of fun things I forgot I had. I also uncover plenty of things I probably shouldn’t have–you know how that is, UFOs (unfinished objects) that you’ll probably never finish or that you love too much to toss but you don’t know how you should finish them, or things that are broken or missing a part. One such thing I’ve found is a little bag of broken gemstone beads. 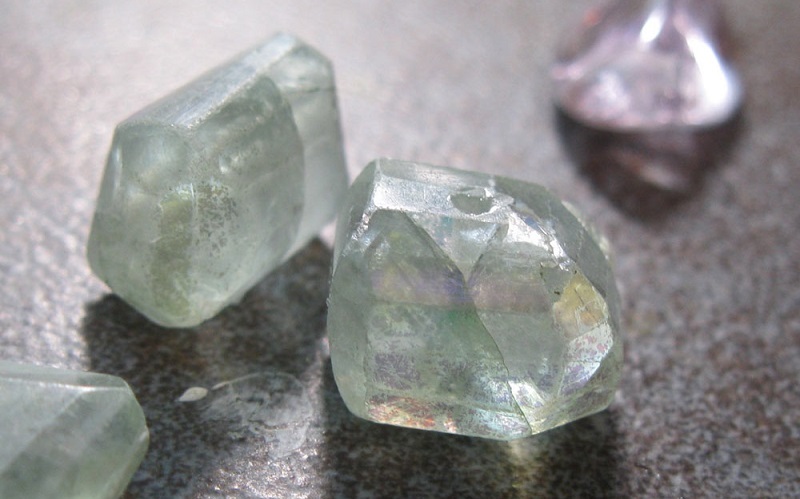 They’re gemstones after all; how could I just throw them away? I hardly ever do any stringing anymore, but I’ve had this little bag saved for a couple of years now, knowing (hoping) that I’d find a good way to use the pieces in jewelry designs. But I haven’t found a way. I’ve found two! All bezel projects shown here by Stephanie Gard Buss for Nunn Design. 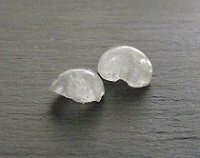 Somewhere in the past year or so I heard the tip of using broken gemstone beads as cabochons. This works best for larger beads, of course, when they crack such that you have a good half-bead left over. It’s pretty much a cabochon shape at that point anyway, it just has a rough, not-so-flat back you’re unlikely to find on an intentionally cut cab. 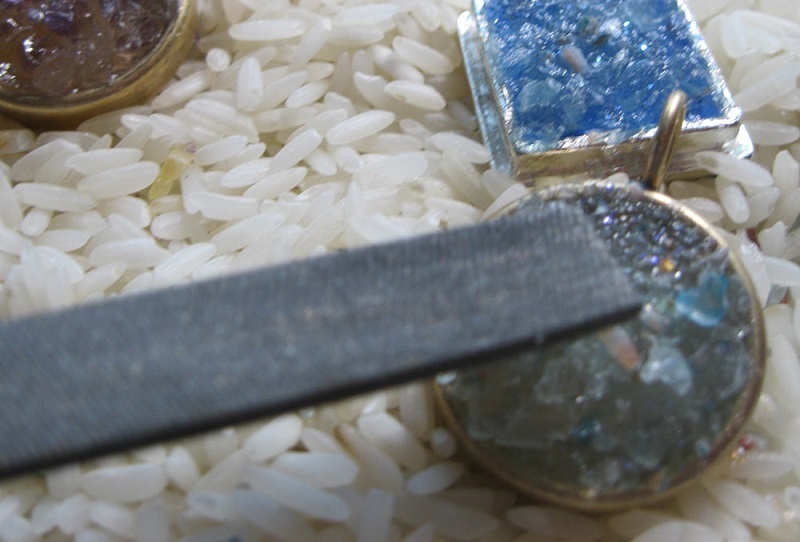 If you have the tools and equipment, you can grind and sand the back to be flat enough to set the half-bead gemstones in a bezel. 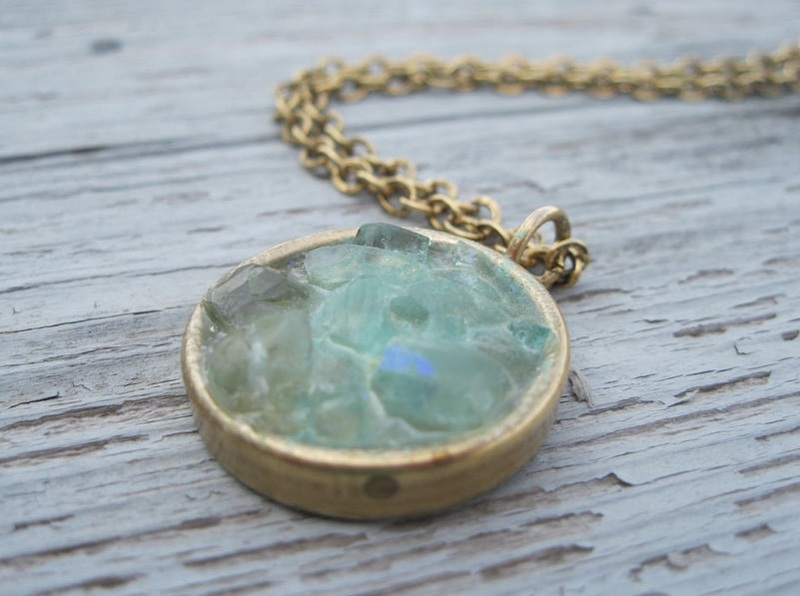 Then just set it in a bezel that you’ve bought or made like you would set any other cabochon. Voila! Trash to treasure, complete with an interesting story. 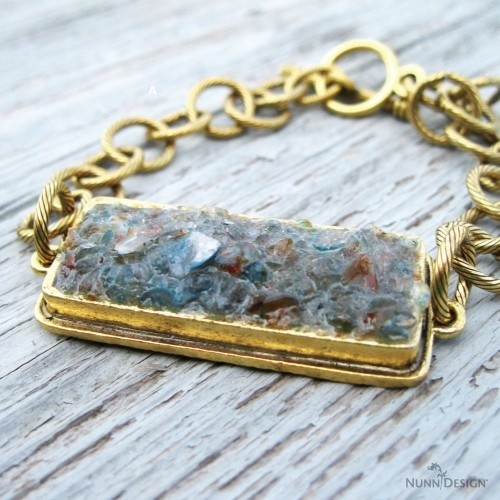 We have Nunn Design Innovation Team designer Stephanie Gard Buss to thank for the idea of using broken gemstone beads and chips set in a bezel of resin to create the look of faux drusy (aka druzy) or even a chunk of crystal-covered gem rough. I love how easy it is to do–practically foolproof. Stephanie broke gem pieces by securing them in a bag and pounding them with a hammer; you can do the same, if you don’t have a stash of broken gem beads already. Topaz and quartz gems like amethyst, citrine, and smoky quartz are ideal for this technique because they’re inexpensive and readily available in lesser qualities (that you might be willing to break up! ), even at large craft stores that don’t specialize in jewelry-making supplies. 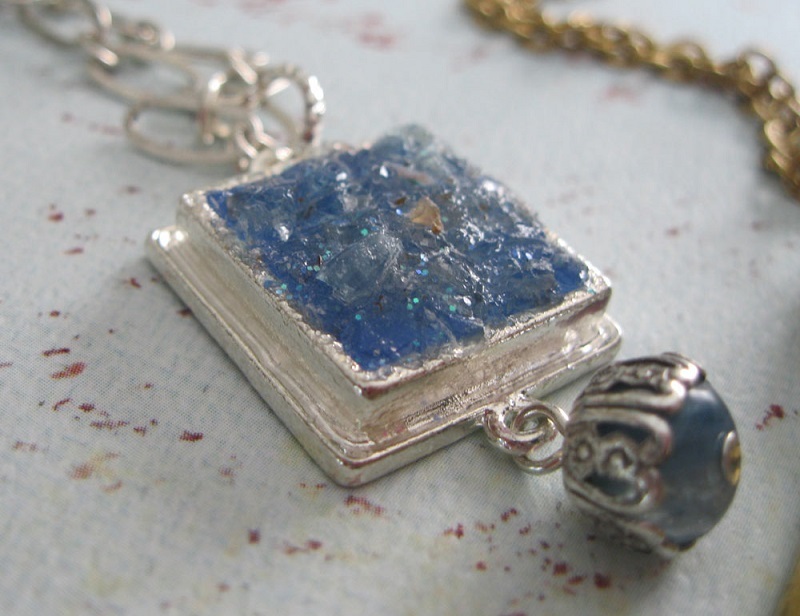 Here’s how she made a faux drusy pendant. 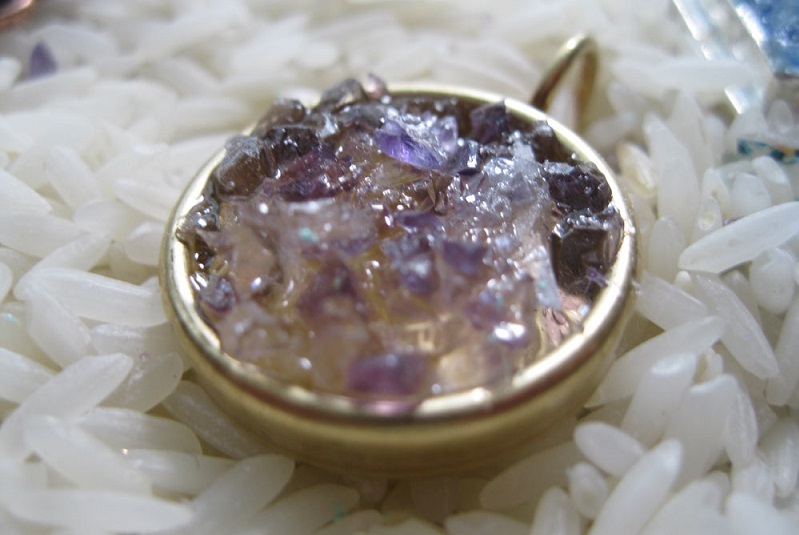 Broken gemstones + resin = a drusy-like cabochon! 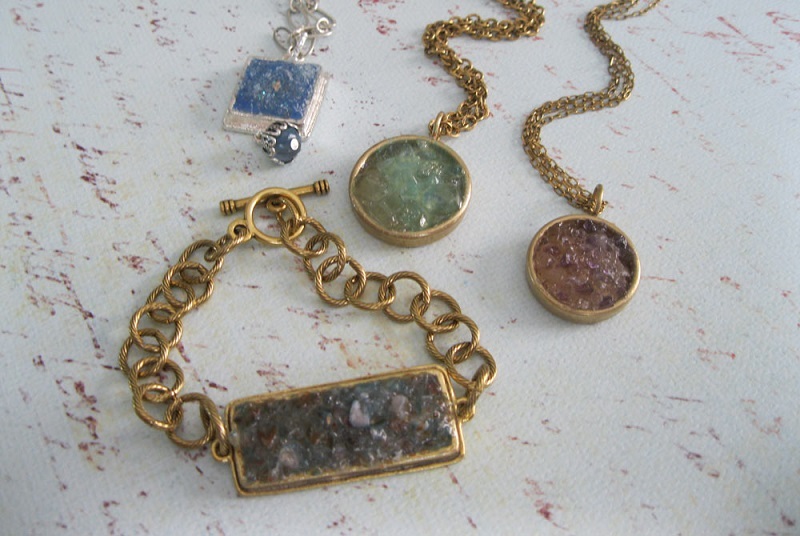 To make a faux drusy, I’ve used relatively soft stones that you can smash with a hammer. 1. Mix your resin well and set aside. Have extra cups available if you want to use a colorant or add mica to your resin (or both!). 2. Place the stones in a zipper bag and smash with a hammer. I kept the colors separated; you can do that or mix them. 3. 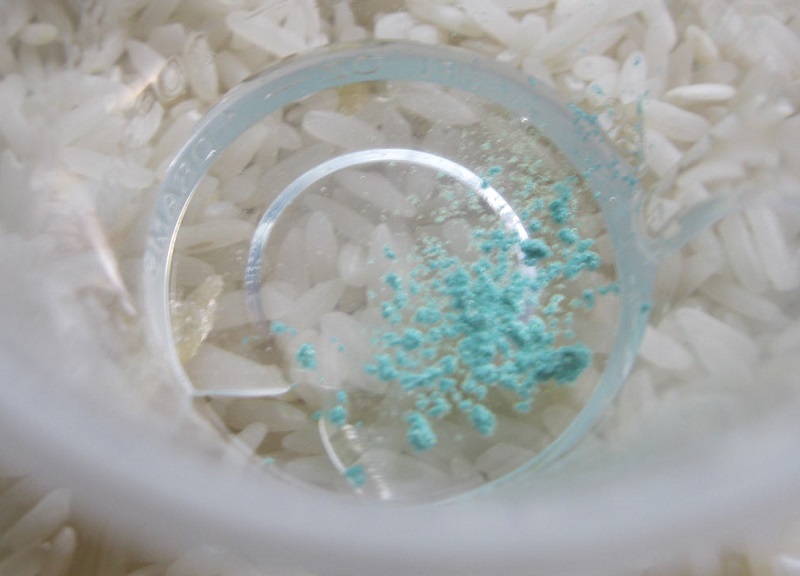 If you want to use a colorant, mix your clear resin with the colorant in another cup. 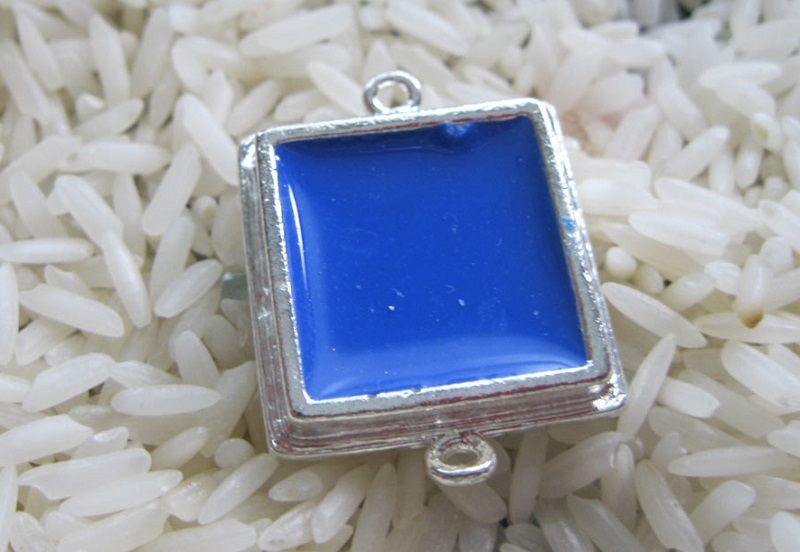 I happened to have a bezel that I had already half-filled with a bright blue colored resin. I also mixed mica powder in with resin in a separate cup to add a little color and shine. Mica is, after all, rock, and it gives a lovely pearlescent shine. 4. Pour resin into your bezel base, filling only about a third. 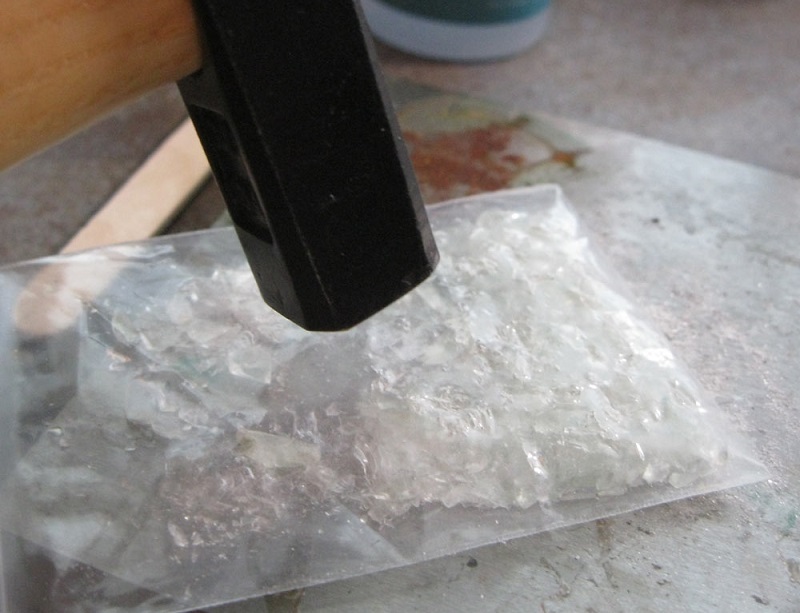 Using tweezers, place your crushed stone pieces into the resin. At this point, if your stone is really light, you may decide you want to add a colorant as the stone seems to disappear into the resin. That’s ok. You can stir it all (stone, resin, and mica or colorant) together in the cup and scrape it back into the bezel. 5. When you have the look that you want, fill with more resin if needed. If you want to add a bit of sparkle, now is the time to sprinkle on a bit of glitter (glass glitter or fine glitter). Put a little on a cotton swab and tap gently with your finger for best control. You could use a pearlescent mica powder as well. If it’s too much, all is not lost. Scrape it all out into a resin cup again, mix it around until the glitter is more subtle and put it back into the bezel. 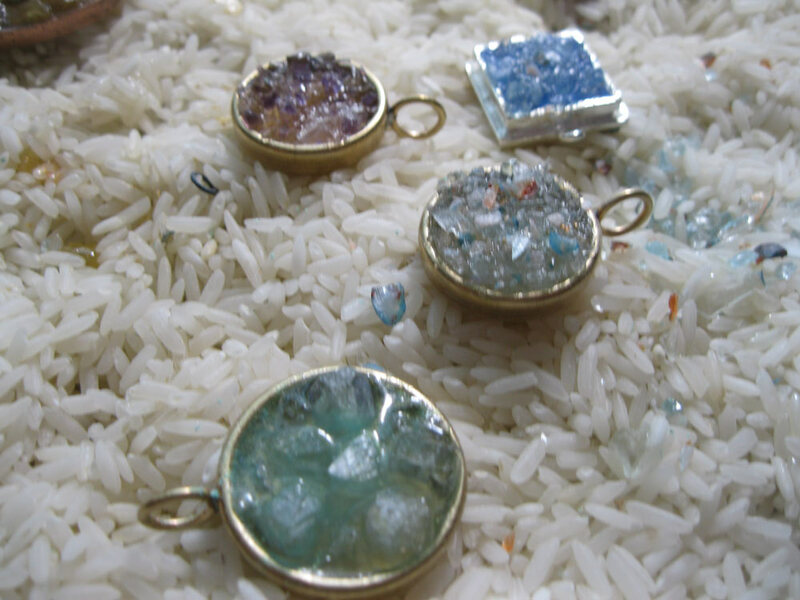 Have several bezels ready so you can play around with different colors. 6. When you like it, set aside to cure for the recommended time for your resin. You may want to wipe around the outside of the bezel to make sure there’s nothing stuck to it. 7. Once they are cured, and this is VERY IMPORTANT, file off any sharp points. Don’t slice your finger open like I did! Such a fun and thrifty project! I love finding ways to use things that I might throw away otherwise or leftover pieces from my stash. Browse the Interweave Store to find hundreds of great eProjects featuring gemstones, bezels, resin, and fresh ways to use up your stash! You can see some of my favorite new ones below, including how to make glasses using slices of tourmaline! About the designer: Stephanie Gard Buss is a member of Nunn Design‘s Innovation Team. You can see more of her jewelry designs in her Max and Lucie Etsy shop. Originally published September 16, 2013. Updated February 22, 2018. 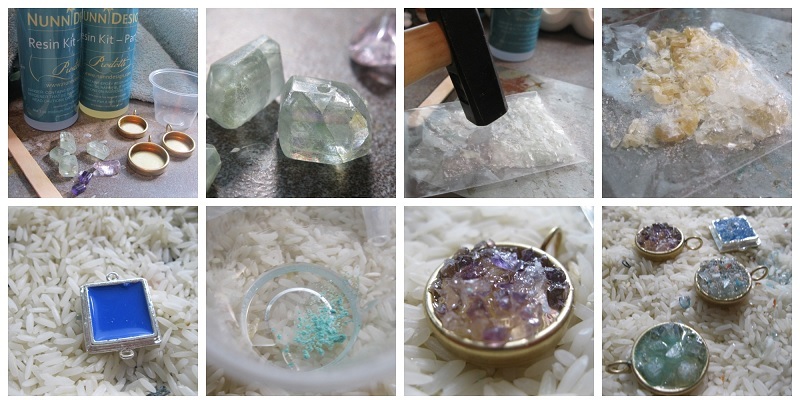 Learn more about using gemstones and making resin jewelry!